News 8 has received a report of a shark sighting at Sunset Cliffs Thursday morning. This is the fourth reported shark sighting in a week. SAN DIEGO, Calif. (CBS 8) - A two-mile stretch of coastline at Casa Reef in La Jolla was reopened Thursday, following the third confirmed shark sighting along San Diego's coastline in a week. The coastline at Casa Reef was shut down, after several people spotted a 12-inch dorsal fin around 1:30 p.m. Wednesday near the Children's Pool, where a colony of seals live. Just hours later, a group of fishermen discovered a dead baby seal off the Ocean Beach pier with apparent bite marks. "The only thing that would have done that is something really with big teeth," said fisherman Jeff O'Connor. "And we figured it's a shark. And it sure looks like a shark bite." The closure at Casa Reef was lifted just before 10 a.m. Thursday because lifeguards, patrolling the area since the early morning, found no evidence of a shark, according to San Diego fire-rescue spokesman Maurice Luque. 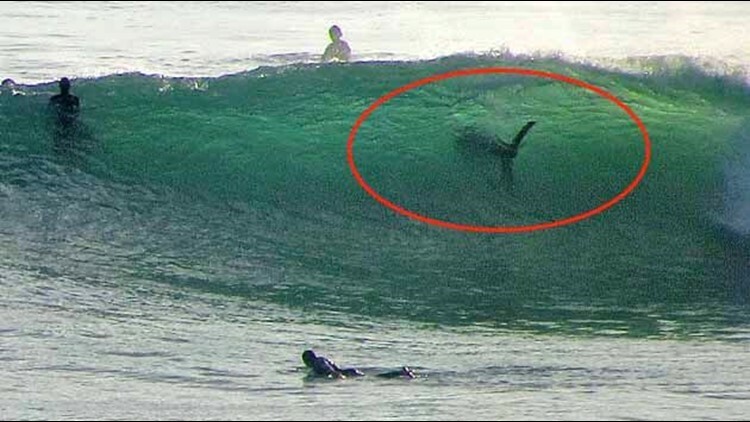 Meanwhile, reports Thursday morning of a 12-inch fin sighting 100 to 200 yards offshore from the 1200 block of Sunset Cliffs Boulevard in the Point Loma-Ocean Beach area turned out to be not credible. A two-mile stretch off Mission Beach was closed last week, after a lifeguard spotted an 18-inch dorsal fin on Thursday. The same area was closed again Friday when a surfer reported seeing a 14-inch fin.